EMS Mini Lab Balances are extraordinarily compact, easy to use, and convenient for a variety of laboratory weighing applications. 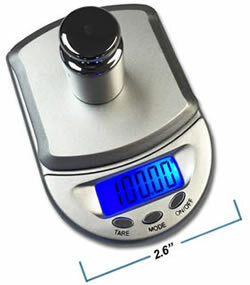 With a footprint of only 2.6 x 3.9", these Mini Balances offer exceptional accuracy and linearity through their full weighing ranges. Designed for portability, EMS Mini Balances are powered by 2 AAA batteries (included). After one minute sitting idle, the power automatically shuts off to conserve battery life. Ideal for lab or field use, each balance includes a snap on, protective cover, with instructions conveniently printed on the underside. Exterior Dimensions 2.6 (W) x 3.9 (D) x 0.75 (H)"
6.6 x 9.9 x 1.9 cm 2.6 (W) x 3.9 (D) x 0.75 (H)"
These weigh boats are made from FSC® Certified (FSC® Mix) paper (Eco-IN) and will naturally biodegrade when disposed of in the standard waste stream (Eco-OUT). Our weigh boats are useful for liquid, powder or granular samples. They made of antistatic polystyrene and will withstand temperatures up to 90°, as well as exposure to diluted acids, alcohols, bases and aqueous solutions. Their flexibility and smooth interior surfaces with rounded corners allow for easy decanting of powdered samples. Their flat bottoms ensure stability amd prevent tipping. Weigh boats are available in the traditional square shape, as well as the new diamond shape, for easier pouring and more stable transfer of liquids. 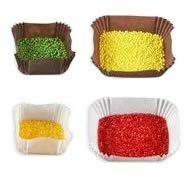 Originally designed as weighing containers, they have proven ideal for dispensing & storage and as disposable mixing/quick freezing trays. They are available in black or white for improved sample contreast/visibility and packaged in ultra-compact dispenser packs. 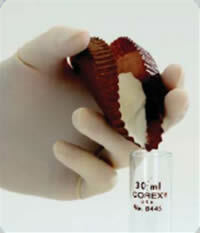 They are utilized to weigh liquid or solid samples. Anti-static. Recessed corners facilitate controlled pour-off. Square shape, contour bottom. Inexpensive, disposable aluminum foil dishes with crimped sides, flat smooth bottoms, and a finger tab handle on the rim. They may be used for routine weighing and moisture testing, as well as an embedding mold. 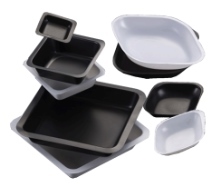 No Static Build-Up – Glassine is free of static electricity that plagues disposable plastic weighing dishes. 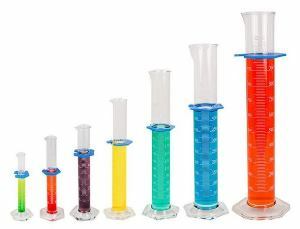 These glass cylinders with pour spouts feature heavy uniform wall tubing and strong, stable, hexagonal bases. Made from borosilicate glass. Aluminum Foil Squares interleaved for easy separation. 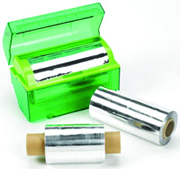 These foil rolls which are designed to work with out Mini BinTM Foil Dispenser and offer minimal waste. Custom sized pieces of foil can easily be created for covering small surfaces such as beakers, flasks, tubes, and Petri dish. Ideal for autoclaving, freezing, incubating, protecting lab ware, lining, sealing and general storage. Available in two sizes. This Mini Bin Foil Dispenser allows you to safely cut foil to any size and it is a great alternative to wasteful giant-sized foil rolls and expensive precut foil squares. Compact to fit in limited work space areas and easy to transport. Safe to use – load the foil roll, press the cover to activate the safety blade and cut to the desired length. For use with 102 mm or 153 mm (4 or 6 inch) foil rolls (sold separately- see below).The dispenser measures 19 x 10 x 12 mm. The unit has a non-slip base, has a safe - unique cutter guard with a safety blade and it is compact – for limited spaced work areas. It is able to hold 102 mm or 153 mm (4 or 6 inch) foil rolls The unique – foam strip prevents the foil from retracting back into the unit.